November | 2013 | DEBtastic Reads! Thank you to everyone who stopped by to shine the spotlight on Julie Berry and her incredible YA novel, All The Truth That’s In Me. I highly recommend this book to anyone who loves a mystery and love story and intriguing characters. I used a random number generator to choose the winner of a copy of this awesome novel, along with some fun swag from Julie! So, who is the lucky number? Commenter number five – Cindy Faughnan – come on down! Congratulations! Please email me with your mailing address and I’ll be sure to get your prize in the mail ASAP! Thanks again to everyone for stopping by! Happy Thanksgiving! I am very thankful for great books, awesome authors, and you – my faithful readers! Welcome to the Spotlight: Julie Berry and All The Truth That’s In Me! 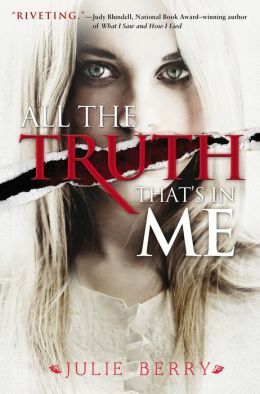 I’m super excited to shine the spotlight on author Julie Berry and her amazing YA novel, All The Truth That’s In Me. I met Julie this past March when she did a presentation at the Vermont College Novel Writing Retreat. She is super smart and very talented. Stayed tuned below for a chance to win a copy of her novel. Judith Finch returns to her home town of Roswell Station, two years after her disappearance. Her friend Lottie is dead. Judith’s tongue cut out by her captor, no longer speaks. Her mother forbids it. The village folk who used to be her friends, shun her, all except for Lucas. She tries to live out her life, but can’t ignore the secret that her captor was Lucas’s father, long thought dead. When Roswell Station is about to be attacked, Judith returns to her former prison to seek help and receives it, but then receives further suspicion and malice from the town. The mystery of who killed Lottie haunts her, and as the town starts to come to wrong conclusions, Judith must choose to speak the truth, despite her fears of being called a liar. Lucas, Judith’s younger injured brother, the pretty Maria, and even Goody Pruitt come to support her and give her the strength and confidence she both craves and needs to speak the truth. A riveting, haunting tale that sparks with hope. Can you share the journey of this story? From idea to publication – what was the spark, how long did it take you to draft the story, and what was the path to getting it published like? The spark was rather mundane. I was reading some material in a craft book about point of view in preparation for an essay that I wrote for Vermont College of the Fine Arts, when I was pursuing my MFA. I read about second person and wondered if I could use it effectively. I reached for my computer and mulled a moment. Three words appeared in my mind: “You didn’t come.” From them a character and a scene soon emerged. In about 45 minutes I had written what is now the first chapter of the book (Note: my chapters are super short in this story. Chapter is probably the wrong word.) I spent the next six months or so writing the novel with the help of Tim Wynne-Jones, my final semester advisor. Then I sat on the manuscript for five years. (!) Based on some initial feedback I thought the market wouldn’t be receptive to a book like this at such an early stage in my career. When I finally brought it out to submit widely, it went to auction with several houses making offers. Clearly there are lots of lessons to be gleaned from that story about taking risks and believing in what you’re doing. I’m curious about the setting for the story. Is Roswell Station a real place? How did you come to choose the time period? Roswell Station isn’t real, but I hope it feels recognizable to readers as a small, foundling settlement reminiscent of America’s early Puritan colonial past. The time period was based loosely on the mid to late 17th Century, because that’s the world it felt like Judith would inhabit. The setting flowed around her like a cloak she was wearing. 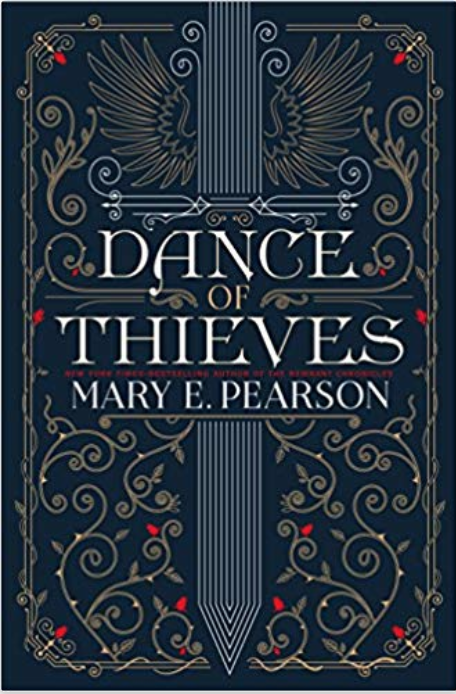 It wasn’t so much a conscious choice, although it was a conscious choice to keep hard details of place and time ambiguous, since I didn’t want the conventions of historical fiction to obscure Judith’s story. My heart ached for Judith and her struggles from her love for Lucas, to her painful memories of her abduction, to trying to fit back into her family and village life. All your characters feel very real to me. What do you do to get to know your characters? In the beginning I pay close attention to how they feel to me, because characters begin as an impression. Then I try to spend time with each one, fleshing out their biography, their family background, their personality, their wants and needs, their flaws and sins, how others have perceived them, and how that has shaped them. I often talk about this when lecturing, because I firmly believe we must invest the same care and attention in getting to know our secondary characters as we do our main character. If we believe that all humans are of equal worth, then our writing should reflect that belief. Otherwise we write narcissistic texts without realizing we’re doing it, where the only human than matters is the one in the center. A full cast of full human beings will produce more authentic and surprising situations, I believe. There are so many fascinating elements to ALL THE TRUTH THAT’S IN ME – love story, murder and abduction mysteries, secrets and lies. I was completely hooked and immersed! What were the biggest challenges you faced while drafting the story with so many intricate subplots? You did an amazing job of making it all come together! Thank you. 🙂 I did keep a notebook in which I attempted to isolate and trace all the threads that went into the story. The mystery elements made it doubly important that I get those details right. As for the characters and their secrets, each one came with such a clear (to me) identity and history. It made them distinct and memorable to me, so it wasn’t as hard as you might think to keep track of it all when writing. It was actually fun. Judith finds solace in the company of animals. I love that. Do you have a favorite pet/animal? As I write this, my cat Coco is curled on my lap. Our other cat, Athena, is sweet, and she likes me just fine, but Coco is devotedly mine. She baps me with her paw to tell me it’s time to go to bed each night. As soon as I lie down she flops on top of me, staking her territory. I don’t know what I ever did to merit such devotion. I grew up in a large family, and we always had oodles of pets, as well as farm animals. A life with animals is located deep in my sense of how the world ought to be. About Julie: Julie Berry grew up in western New York. She holds a BS from Rensselaer in communication and an MFA from Vermont College in writing for children and young adults. She now lives in eastern Massachusetts with her husband and four young sons. All the Truth That’s in Me (September 2013, Viking) is Julie’s first YA novel. It has earned starred reviews from Kirkus, School Library Journal, Publisher’s Weekly, BCCB, and the Horn Book. It’s been named a Junior Library Guild selection and been nominated for a YALSA BFYA award. It will be published in 12 international countries and territories. Julie is also the author of The Amaranth Enchantment and Secondhand Charm (Bloomsbury) and the Splurch Academy for Disruptive Boys series (Penguin Books for Young Readers). A forthcoming middle grade release is The Scandalous Sisterhood of Prickwillow Place (Fall 2014, Roaring Brook). Julie’s works appear in audio and international versions worldwide. For more about Julie and her books, check out her web site, follow her on Twitter, find on her Facebook, and on Tumblr. 1. Comment on this post, and for fun, tell me about your favorite pet/animal. While I love all animals, I’m definitely a dog person. I adore my rat terrier Trixie – those of you who follow this blog know that she often helps pick the winning name for these drawings. 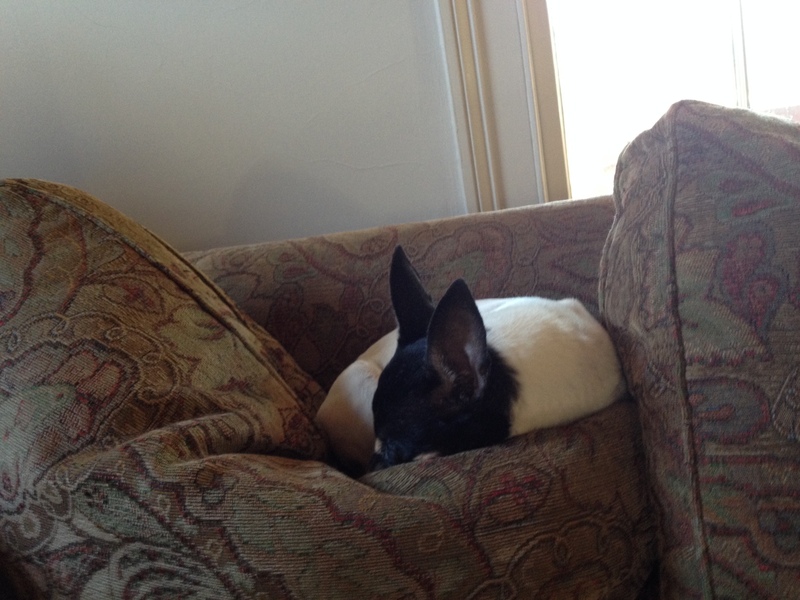 I’ve had many dogs in my life, but Trixie, like Coco to Julie, is particularly devoted to me. 2. Leave your comment and email address by midnight EST Friday, November 22nd. The lucky winner will be drawn at random and announced here on Tuesday, November 26th. 3. If the winner doesn’t respond with a mailing address in 7 days, a new winner will be chosen.